Available across all engine variants, including the T8 Twin Engine, the offer includes a three-year 100,000-mile warranty, a like-for-like replacement vehicle programme, direct aftersales support, service plan options and competitive pricing – while contract hire offers for up to 50,000 miles per annum are also available. The programme also incorporates a comprehensive ‘Chauffeur Pack’ of options included as standard, covering features such as tinted rear windows with integrated sun curtains, a three-pin plug socket in the rear console, four-zone climate control and a cooled glovebox, along with door handle recess wear protection, a cargo area textile mat and a leather care kit. 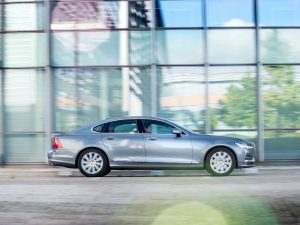 The three models also include a wide range of safety equipment as standard, including City Safety, as well as debuting Volvo’s Run-off Road Mitigation and Large Animal Detection technology. In addition the Pilot Assist system, which operates at speeds of up to 80mph, supports the driver with steering, accelerator and brake inputs to keep the car in its lane and at the desired speed. Connectivity systems on offer include Apple CarPlay and Volvo On Call while passengers can benefit from the car’s own WiFi hotspot. Volvo will also offer PCO licensed demonstrators available to test drive. Sarah Symcox, strategic partnerships manager, Volvo Car UK, said: “To make sure our offering was as compelling as possible, we carried out extensive research into the requirements of chauffeur drivers. With a wealth of advanced safety technologies, connectivity features and interior comfort, the new Volvo S90, V90 and XC90 each offer a great package for chauffeurs and their passengers to meet those needs – especially when equipped with the Chauffeur Pack.